Waldshut, Baden, Germany, since 1975 known as Waldshut-Tiengen, a city on the Rhine (coordinates: 47.623056, 8.214444 [47° 37′ 23″ N, 8° 12′ 52″ E]), had a population of 22,500 (2005). The city is on the border to Switzerland, about 30 miles (48 km) east of Basel and about 25 miles (40 km) northwest of Zürich. Waldshut was the seat of an Anabaptist congregation from April to December, 1525. Dr. Balthasar Hubmaier came to Waldshut from Regensburg as Catholic pastor in the spring of 1521, where he gradually became a Lutheran (from 1522). Early in 1525 he began to question infant baptism. On 2 February 1525, Hubmaier published his Oeffentliche Erbietung, offering to prove in a public debate that infant baptism had no foundation in Scripture, but the request for a disputation was not granted. When Wilhelm Reublin appeared in Waldshut from Zürich, he found a ready response in Hubmaier who was baptized on Easter (16 April) with 60 others by Reublin. Hubmaier in turn baptized over 300 others in the days immediately following Easter, using a milk bucket filled with water from the fountain in the town square. He also served the new congregation with the Lord's Supper and washed their feet. Apparently a substantial part of the town's population became Anabaptist. Strangely nothing further is known about the Waldshut Anabaptists, although the congregation must have continued until the final capture of the city by the forces of the Austrian government, which occurred on 5 December 1525. Hubmaier himself fled, telling the city council at its "surrender" meeting on 5 December that since Catholic worship would be restored by the conquerors he could not stay. Crous, Ernst. "Auf Spuren der Tauter am Oberrhein." Der Mennonit 10 (1957): 42 f.
Bender, Harold S. "Waldshut (Baden-Württemberg, Germany)." Global Anabaptist Mennonite Encyclopedia Online. 1959. Web. 20 Apr 2019. http://gameo.org/index.php?title=Waldshut_(Baden-W%C3%BCrttemberg,_Germany)&oldid=134688. Bender, Harold S. (1959). Waldshut (Baden-Württemberg, Germany). Global Anabaptist Mennonite Encyclopedia Online. 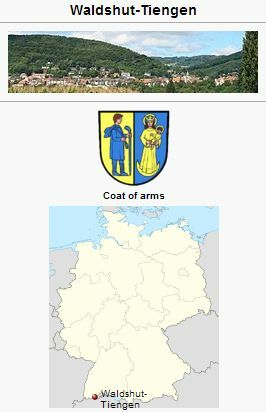 Retrieved 20 April 2019, from http://gameo.org/index.php?title=Waldshut_(Baden-W%C3%BCrttemberg,_Germany)&oldid=134688. This page was last modified on 22 June 2016, at 16:40.